It’s the start of the marathon! Phantom Hourglass is the unexpected MVP of the Zelda Dungeon Informer marathon. Phantom Hourglass is how we kick off the marathon every year and this year is no exception. If that’s the case then what’s the deal? What makes it so special that we absolutely need to clear our schedule for the game? Other than kicking off the marathon with a full playthrough of Phantom Hourglass, we will be playing the multiplayer battle mode of Phantom Hourglass for the first time this year! We have allotted some time to play the battle mode for Phantom Hourglass in a tournament style in two blocks. The first block’s winners will advance to duke it out in the second round later on in the marathon to see who is the true Phantom Hourglass battle mode champion. 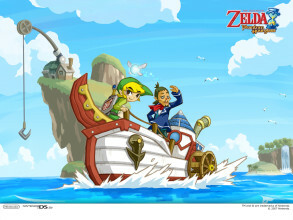 Multiplayer in Phantom Hourglass functions like capture the flag with one player controlling Link, while the other player controls three phantoms. Both players flip sides to play as the other character as well. The objective is for Link to grab Force Gems and bring them back to his base while the Phantoms are tasked with catching Link. The rounds can last up to 12 minutes if Link avoids the Phantoms the entire round. Expect some hilarity as we give Phantom Hourglass a little extra love this year. What we’re doing with Phantom Hourglass in a nutshell: Kicking off the marathon with a complete playthrough of the game. After we complete the game we will play a few rounds of the multiplayer battle mode that the game has in two separate blocks of time in the marathon.